Sonic the Hedgehog Pocket Adventure (ソニック・ザ・ヘッジホッグ ポケットアドベンチャー) is a Sonic the Hedgehog game for the short-lived Neo Geo Pocket Color handheld console. It was released in late 1999. 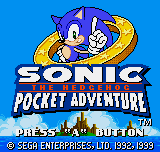 Sonic Pocket Adventure can be seen as a "hybrid" Sonic game, rather than a brand new release. Its levels are mostly inspired by Sonic the Hedgehog 2 for the Sega Mega Drive, though some share elements from the first game and the majority of the music is recycled from Sonic 3 & Knuckles. Some tunes are also recycled from the Sega Saturn compilation Sonic Jam. It is not a straight port of any of these games, however, as it introduces brand new bosses, a "puzzle" mode and a few original soundtracks of its own. Sonic Pocket Adventure is the only game in the series to successfully mix the modern post-Sonic Adventure design of Sonic with his classic Mega Drive-style counterpart. The in-game graphics look similar to the classic style, while on the title screen and other up-close artwork Sonic resembles his modern design that debuted in Sonic Adventure. This mix of styles also applies to Dr. Eggman - in the early levels he has his original design, but he switches to his Sonic Adventure design on Sonic reaching his base. Sonic is the only playable character in Sonic the Hedgehog Pocket Adventure, however if two Neo Geo Pocket Colors are linked together, one can initiate versus mode, in which the second player controls Tails. Tails is not available in normal play without hacking. Sonic Pocket Adventure would be the last Sonic game to just feature Sonic as a playable character until 2007's Sonic and the Secret Rings. Each of the six "act 1"s has a special stage containing a chaos emerald, and are triggered by jumping into a giant ring at the end of the stage (assuming Sonic has at least 50 rings). Unlike earlier games, the special stages are linked directly to the level (e.g. the first special stage can only be accessed from Neo South Island Zone, the second only from Secret Plant Zone, etc.). As Sky Chase Zone and Aerobase Zone count as a pair, this only leaves six special stages - the final chaos emerald is obtained in Last Utopia Zone, in which Sonic has to aim for the emerald powering Eggman's machine rather than Eggman himself. Collecting all seven chaos emeralds will open Chaotic Space Zone, a Super Sonic-only stage. Like the Sonic Advance games, it is impossible to play as Super Sonic in normal stages. Hidden throughout Sonic Pocket Adventure are puzzle pieces, which when collected, can be used to construct artwork. Completing three puzzles unlocks a sound test mode, and completing all six unlocks a special stage option.